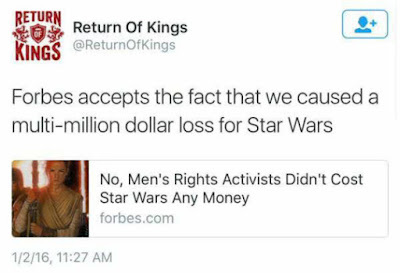 Infamously gross men's rights website Return of Kings (whom I will not link to) were apparently at the forefront of the """"movement"""" to boycott Star Wars: The Force Awakens because blah blah feminist propaganda jibber jabber jibber jabber clang clang clang. Now they're trying to claim that their efforts were a success, using bad math and wild assumptions to guestimate that they cost the movie about $4 million. Quite possibly the funniest and most satisfying thing I've seen in a good long time. That Forbes article explains better than I do how paltry the supposed $4 million is to the point that it's practically nothing and comments on how bad the math is, and all MRAs can do is look at that and somehow think it proves them right and is not instead a concise explanation of why they're so embarrassing and how big of failures they are. I just love how the Forbes headline and the Return of Kings headline are such direct opposites, like, wow. Such a beautiful and poignant demonstration of how far up their asses they truly are. This is art.